Electronics manufacturers have to juggle a number of challenges simultaneously that, when brought together, have the potential to create the perfect storm. Just to name a few, these include the increasing complexities of products and products, shrinking operating margins, and heavy reliance on the global supplier network. Luckily, each of these factors has a common denominator: quality management. The earlier you can build quality into complex products or processes, the better you will be able to manage these challenges and reduce unwanted costs in the long run. As a consequence, it’s critical to have strong quality capabilities closer to product development and sourcing processes. Market leaders have realized this and it’s triggered considerable investments in supplier quality management (SQM). This post will inspect specific approaches you can take to get the most out of your supplier relationships, enabling a communicative and collaborative environment that fosters real improvements in risk, compliance, quality, and efficiency that can be felt across the enterprise. When it comes to SQM, among others there are two capabilities that stand out as instrumental to catching and resolving quality issues before they’re even shipped and reducing risk of doing business with particular suppliers: portals and scorecards. - Supplier Portals: Typically delivered over the cloud, a supplier portal can bridge the gap between suppliers and the rest of the value chain. Today’s companies can leverage portals to take more control over supplier activities and facilitate two-way communication and collaboration. Electronics manufacturers can, for instance, obtain better visibility into test results and order status information such as delivery times, as well as make changes to engineering requirements. - Supplier Scorecards: Scorecards can be thought of as a directory of suppliers that entails very specific data ranging from basic demographic information up through potential impact to your risk portfolio if you choose one to source a part of component. With scorecards, you can evaluate and even rank suppliers based on past and current performance, assigning a numerical value to each. This is becoming more and more important as the electronics manufacturing industry leverages global suppliers to improve operating margins and offer competitive pricing. For electronics manufacturers, it makes sense to deploy and standardize SQM capabilities globally. It’s become increasingly common for them to be delivered as part of an enterprise quality management software (EQMS) solution, which is essentially a hub for centralizing, streamlining, and standardizing quality process data and content. Many companies are applying this holistic approach to get more out of relationships with suppliers. Fortunately, EQMS functionalities in addition to scorecards and portals typically work in conjunction with one another, which really enhances the impacts that quality process data and content can have. For instance, supplier scorecard data can interoperate with global risk management to provide executives with a better understanding of the enterprise risk portfolio. Similar closed-loop synergies can be found with other functionalities. Because SQM capabilities delivered through EQMS bring together traditionally disparate data sources and processes, its holistic nature tends to deliver significant end-to-end benefits when compared to manual or homegrown processes. This is not simply theoretical; it’s been proven in LNS Research’s 2012-2013 Quality Management Software survey that asked over 500 executives detailed questions on quality performance. 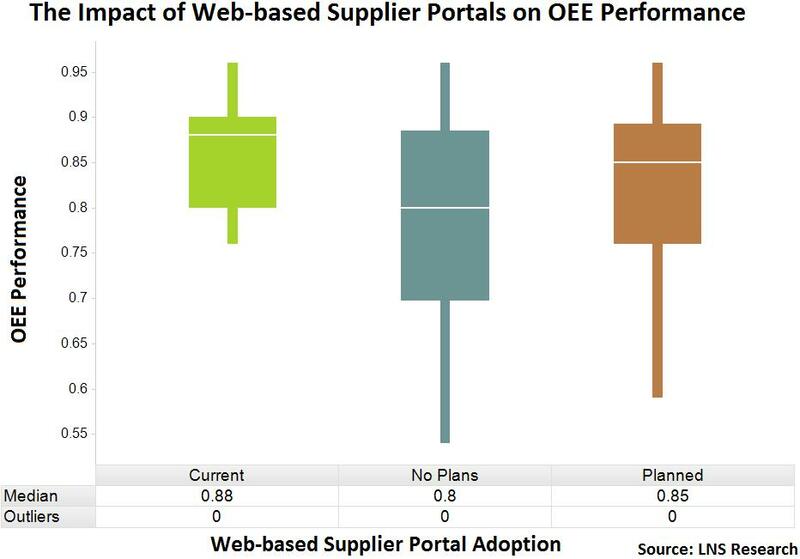 The below box plots cross-analyze the adoption of web-based supplier portals with performance in the overall equipment effectiveness (OEE) metric. As can easily be seen, companies that are leveraging portals to automatically collect supplier data and open up lines for collaboration are outperforming others without that capability. Companies with supplier portals have a median OEE of 88%, outperforming others by 3% and showing considerably less variation in performance. Since the metric comprises variables including quality, availability, and efficiency, earlier interaction with suppliers and communication of quality deviations is likely the driving factor for improved OEE performance. Electronics manufacturers looking to drive improvements in key quality metrics such as OEE would be well suited to automate traditionally manual supplier quality management processes. The improved visibility and impact on efficiency provided by portals is only the tip of the iceberg with today’s SQM functionalities. Companies are also leveraging scorecards as well as a range of other interoperable functionalities such as SPC, supplier corrective actions, and more.